A toddler from Haverhill is extremely lucky to have escaped almost certain death after a fall from a second-floor window in Lawrence. According to local officers, the 20-month-old child was taken to the Lawrence Memorial Hospital after the fall and was treated and later released. The accident happened before 10:00 a.m., according to The Republic. Police reports indicate that the boy pulled himself up onto a bench that was near an open window. He pushed through the screen on the window and fell to the pavement below. The boy escaped with only scrapes on his back and elbow. Our Boston child injury lawyers understand that there were nearly 100,000 children treated for injuries sustained from falling from windows between 1990 and 2008. That means about 5,000 kids end up at the hospital every year because of these accidents. You might not think that it’s a big deal and that it won’t happen to you or your child, but the truth of the matter is that falls are a leading cause of traumatic brain injury and toddler death. As you could believe, children are more likely to fall from windows when the weather’s a little warmer, like it is during this time of the year. Boys are more likely than girls to fall from windows, too. According to a recent study from Pediatrics, children under the age of 4 are most likely to suffer from head injuries and to be hospitalized from head injuries. It doesn’t have to be a long fall either. 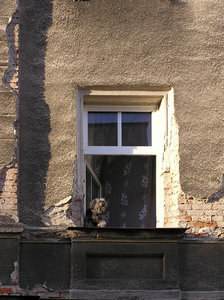 Children who fall out of first-floor windows can end up in the hospital with some serious injuries. Make sure that your house has the proper safety precautions to make sure that children can’t access windows. Talk with their babysitters and other childcare providers to make sure that they’re taking the same safety precautions. You can never be too careful. This can help to drastically cut down on the risks for these kinds of accidents. Homeowners, daycare centers, churches, hotels and landlords should consider placing cushioning of some sorts beneath windows, instead of concrete, asphalt or even plain dirt or grass. It’s also wide to block windows so small children cannot access them. -Keep windows and doors locked whenever children are present. -Never place any kind of furniture near a window. Children will climb. -Always open windows from the top and not the bottom. -Install child safety window guards. These kinds of falls are such a serious problem that the Boston Public Health Commission has launched the “Kids Can’t Fly” campaign. Falls are the leading cause of death for kids under the age of 6. It only takes a second for one of these accidents to happen, too. Be ready and take all of the necessary safety precautions to stop it beforehand. By combining education and engineering, we can help to protect children from dangerous falls. If you have been injured in an accident in the Boston area, contact Injury Lawyer Jeffrey S. Glassman for a free and confidential consultation to discuss your case. Call 877-617-5333.